I can't believe I am posting this on time this week! I am so on top of my game, I can't even stand it! We are halfway to a baby today!!! Weight gain: Ok, so my official weight at the doctor’s yesterday was 134. Which means I have gained 14 pounds! I had no idea it would be so much, but my doctor was super sweet and reassured me that she wanted me to gain as much weight as possible. She told me she gained 50+ pounds with both her pregnancies (she’s pretty tiny, like me) and she’s convinced that babies turn out cuter when the mom gains more weight! I like her thinking, so I’m not going to stress out about my weight too much! Maternity clothes: Yep! Some non-maternity dresses and shirts still fit, but my closet’s getting more limited by the day! Gender: Ahhhhh! This is the last time I will write that I don’t know!!! I still think BOY…final answer. Movement: Yes! The flutters have been a little bit stronger this week, but no serious jabs yet! Cravings: Pasta, fruit, pickles and ice cream. Also, I’m pretty sure that I am single-handedly keeping the fruit snacks industry alive…I eat like 12 packs a day, haha. Symptoms: Round ligament pain, stretch marks (my doctor said they may be from my running…who knew running would cause stretch marks?! ), headaches. Also my heartburn seems to have gotten a little more intense this week, as have my, um, gas pains in my stomach/ribs. Workouts: I ran 20 miles this week! Every day after school! Yay! My doctor said I can keep running as long as I feel good and keep my heartrate under 160. Although, I may have to start wearing a belly band for support. Sleep: Ok…some nights I toss and turn a lot. I have been trying really hard to sleep on my side, but it’s so not comfortable for me! What I miss: Caffeine still, in a major way. Also, I really, really REALLY wanted a big sub sandwich again this week. Best moment this week: Seeing our little peanut yesterday at our hour long ultrasound!! He/she looked super cute and BIG! Crazy how fast they grow in there! We got to see all of its 10 fingers and toes, and all of the other measurements taken were right on track. Baby is so healthy and we are so thankful! 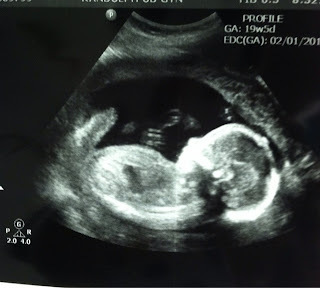 We closed our eyes while the ultrasound tech looked for our baby’s “gender parts,” although Baby Ferg was being a little difficult—he/she had his/her legs crossed and would NOT uncross them! The tech had to basically jab my stomach with the sonogram thingy and then I had to roll onto BOTH sides. Clearly, this is Trav’s child….so difficult! But she eventually got the gender! After the appointment, I delivered the sealed envelope to my sister in law, Caitlin, who will be making our cake for the party! No one knows except her and her roommate!! Looking forward to: Do I even have to say it??? The GENDER REVEAL, duh! When is your gender reveal? I am so excited to find out about Baby Ferg!! Are you going to be sharing names...or will that be a secret? So excited to see what you're having! !